Newlite offers a full range of timber entrance doors for the front, side or the rear of your property. Every one of our timber front doors offers, luxury, quality and character. You also get high security and outstanding long term performance. Best of all you get all the personalisation options thanks to a choice of colours, glass options and door furniture. Our range of Entrance doors, French doors and sliding doors complement our timber window ranges. Choose from traditional or contemporary styles. 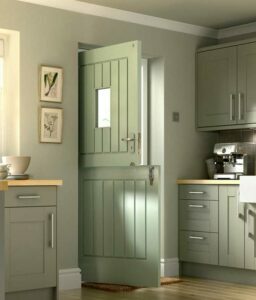 Why consider a Timber door? Our doors come manufactured from the finest strengthened and engineered timber. Furthermore, all doors come expertly crafted with hand finishing as well as the latest technology. As a result, you enhance your home with one of the most dependable yet beautiful timber doors on the market. Internal doors linking a room to your conservatory. 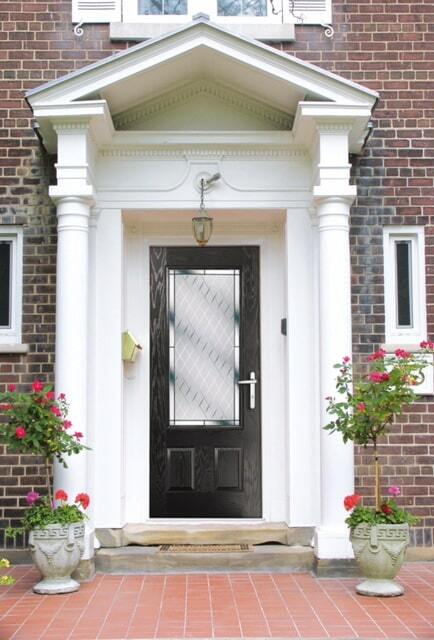 Newlite offer a complete range of stunning entrance doors to create a welcoming, warm and secure entrance. Newlite offer a range of traditional and contemporary entrance doors that are built to last and can make a real statement for your home. You will be impressed with the high quality, weight and feel or our timber doors and the reassuring way it closes shut. Our top quality range of double glazed French doors bring real choice in design and style. Choose from classic or modern styles of doors with optional Georgian or Astragal bars, side or top windows and glazed lights and a choice of opening in or out. Our range of timber French Doors can truly complement both the inside and outside of your home offering exceptional levels of comfort, security and style. The contemporary sliding door solution in wood. Newlite offers an advanced range of sliding patio doors creating space, light and convenience to any property. Available in standard sizes or extra large spans for the creation of sliding glass walls, you also get the best views through large, energy efficient and toughened glass units. Even better is the easy access out to your garden, patio or even a balcony. You can also use any of our sliding doors as an internal room divider. Choose from virtually unlimited colours and finishes. Classic colours are available such as in this timber stable door. We offer our complete range of timber doors in a huge choice of colours. Choose from the very latest in traditional shades or ultra contemporary grey or blacks. We even offer the option of a different colour inside and out. All doors come stained or painted for the ultimate in durability. Not only is the wood treated with several coats of primer, but also durable base and top coats. Therefore the external finish looks great and protects the wood for years to come. All our doors come pre-finished before installation. Choose from either the standard RAL colour range as well as Farrow and Ball and even Fire and Earth colours. A range of sophisticated patio door glass options. 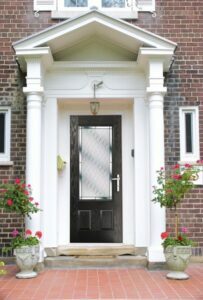 Further options for your door include a choice of Georgian or Astragal bars, leaded lights, patterned, sandblasted and obscure glass. We use only the finest made double or triple glazed units, with advanced insulation, warm edge spacer bars, external coatings. There is also the option of a Secured by Design upgrade with the latest laminated safety glass. All our doors benefit from the very latest in multi point locking systems, high security anti-bump cylinders, top quality handles and ultra reliable hinges and sliding mechanisms. Our doors are tested to the latest security standards such as Secured by Design or PAS 23/24. Other enhancements include a wide choice of modern or period style letter boxes, door knockers, door numeral, spy holes and much more. We even offer a choice of stained and patterned glass. We are your local timber door specialist providing high quality yet affordable timber doors. Guaranteed to resist warping, twisting and offered with long guarantees, your new timber door will perform faultlessly and enhance your home for many years to come. Contact us today for a free no obligation consultation and quotation.